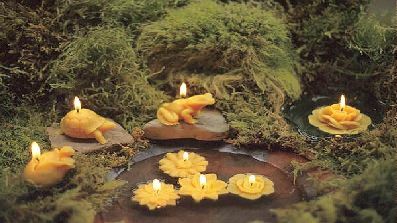 We create fine art, handcrafted, gift collectable, pure natural beeswax candles and ornaments for all occasions. We use no chemicals, scents, dyes or inferior waxes in our products. We make our own molds so our candles are unique, original works of art. To order on line, use our secure credit card service, Pay Pal, by clicking the button under each item. If you prefer to pay by personal check or money order, just email us your order. Customers outside the United States, please email us your order so we can calculate international shipping costs based on package weight.